Packaging Design Archive - BUTTER! BETTER! "The idea for 'Butter! Better!' came to me when on a picnic with friends. It was a really lovely day and we were sharing food, drink and each others' company when I realized that I had forgotten to pack a knife with which to spread the butter. Although eventually able to see the funny side of trying to spread butter with a floppy foil lid, I realized that this could be simply remedied with a small change to the lid of the packet. 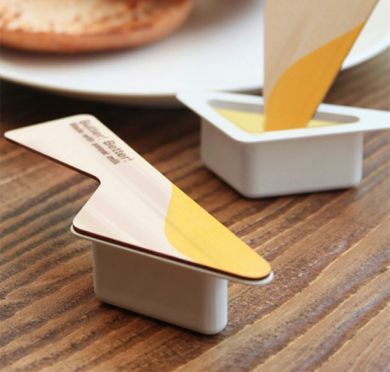 One product that combined both butter and knife would be functional and appealing. As I considered how to improve a long-standing and well known product, I became aware that modernizing the product at the same time would enhance and change an everyday food item-bread and butter-into something much more special. A very simple picnic; bread and butter could be transformed into a special memory by including 'Butter! Better!' in a variety of colors and designs. !